As historians, we know that there are historical continuities and contingencies. We study these, debate these, and occasionally we attempt to make a few insights into the present day. This post attempts to perform the latter. So, here we go again with another Mexican presidential election that is rife with continuities and contingencies. In 2000, the PRI (Institutional Revolutionary Party) lost seventy continued years of presidential power. That year, we observed the elections and the massive eruption of street celebrations when it was announced that Vicente Fox had won the election. Twelve years later, 2012 was the PRI’s come back year, and it ran as a deep-pocketed opposition party with a telegenic candidate Enrique Peña Nieto. Of course, the PRI had less support from the middle and educated classes, groups that the party had courted since the 1940s. With the murder of the PRI presidential candidate Luis Donaldo Colosio in 1994, the Zapatista uprising that same year, and the Aguas Blanca massacre of a group of campesinos (Mexican peasants) in 1996, the PRI lost credibility in all levels of the public sphere. The PRI political machine had long created an illusion of respectability and control through sheer force and media manipulation. However, massacres, social upheavals, bank collapses, power politics resembling organized crime syndicates, hyper inflation, and devaluations became more and more difficult for Mexicans to stomach and ignore. Today, Mexico has a large and educated middle class that devours the consumer fantasies pushed by media outlets. For decades, TV consortiums like Televisa (Mexican network television), have favored PRI candidates, as long as the winner offered the media giant continued benefits. During the presidential campaign, candidates from the PAN (National Action Party) and the PRD (Party of the Democratic Revolution) alleged that Televisa received up to 36 million advertising dollars in exchange for favorable coverage of Peña Nieto as the favorite front-runner. Mexican newspapers routinely have received subsidies from the government, but the continued broadcasting of favorable coverage was perceived as great threat to the democratic process. Enrique Pena Nieto with Carlos Salinas. The images came from a PRD web site that wanted to demonstrate their close relationship. remains more problematic and fuels further sensational questions and accounts regarding the early death of Peña Nieto’s first wife, his numerous love affairs with men and women, and claims of his involvement in domestic violence. Salinas de Gotari’s family’s life was remarkably similar, a minor historical continuity. 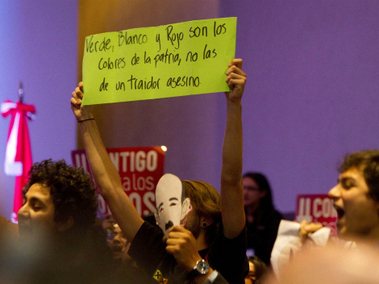 The protesters sign read “Green, white, and red are the country’s colors not those of a murderous traitor.” Notice the mask is the face of Carlos Salinas. university, demonstrated against the PRI candidate during a political rally on the campus. The PRI chose Ibero because it obviously believed the party’s young and handsome candidate would not encounter opposition. The exact opposite occurred. Students wore masks with the image of Salinas de Gotari and yelled “Out with the PRI.” Others booed and chanted “Get Out” or worse. The PRI alleged that this was an isolated incident provoked by pseudo-students. These comments were remarkably similar to those made by the PRI leadership during the initial student protests in 1968. Afterwards, Ibero students, joined by countless others, unveiled themselves on “You Tube” venting their rage against the candidate, confirming their affiliation to the university, and being part of an opposition movement. Jesus Alfredo Guzmán Salazar was listed in the international press as the man who managed his father’s assets. Of course, the government or wealthy opposition parties are always in positions to harness media and social media outlets. For example, shortly before the elections it appeared that there would be a June surprise that might shift the election in favor of the PAN. A week before the election, the Drug Administration Agency (DEA), the Mexican Marines, and Felipe Calderón Hinojosa’s administration claimed that they had captured one of the sons of the head of the of Sinaloa cartel, Joaquín “El Chapo” Guzmán Loera. Images circulated and speculation about the ability of Calderón to capture one of the most powerful drug traffickers. With the arrest of a son, the government seemed close to attaining a primary objective. Twelve hours later, a press communication from the Mexican government stated that the person arrested was not Guzmán’s son, and the June surprise did not occur. Calderón Hinojosa’s hopes of claiming a major victory in his war on drugs, and perhaps saving his party prestige, never emerged. Instead, what he has to show for his hard-line approach are thousands of murders. Since he declared a “total war” against drug trafficking, NGO’s have accounted around 55,000 killings, 5,000 people have been disappeared or kidnapped, and more than 8,000 bodies have gone unidentified. In northern cities, people live in fear due to the ongoing violence. Those who attempt to speak the truth have been kidnapped, tortured, and murdered. More than 81 journalists have been killed since 2000. With Mexico’s drug war being the primary topic of international media coverage on Mexico due to countless deaths, brutal assassinations, and ongoing discoveries of government and police involvement in the drug trade, Peña Nieto never discussed a clear plan to fight against drug trafficking. He dodged any unscripted questions about the topic during his TV appearances. He mentioned strengthening internal security and stabilizing the situation, but not much else. The Washington Post expressed the concerns of U.S. officials regarding the enigmatic candidate, while the PRI attempted to placate the Americans. The PRI has a long ties to drug trafficking. There are too many reports and names to mention here, but the role of members of the PRI in drugs represents a historical continuity. Evidence of these long standing association may be found in newspaper articles, scholarly books, Mexican popular culture, as well as in countless archives. PRI members were involved in drug trafficking, while other PRI members attempted to police those who were involved and mitigate the criticism that came from the United States and other countries. Scholars have been paying more attention to these historic ties between organized crime, drug traffickers, and political leaders. In a recent edited volume, Paul Kenny and Mónica Serrano, along with other scholars, have desribed how some revolutionary leaders sought profits through racketeering such as Colonel Esteban Cantú who first used extortion against poppy growers and opium producers until he went into the business himself. He was displaced by another military leader, General Abelardo L. Rodríguez who took control of the border state just as Prohibition began in the U.S. Rodríguez made a fortune in vice boom that emerged to serve the thirsty and bored Americans who came south looking for a drink and other corporal distractions and pleasures. In other states, the profitability of narcotics became exceedingly difficult to avoid. Other generals who emerged as political bosses and governors continued to be involved in organized crime, much of it associated with the narcotics industry. In Chihuahua, General Rodrigo M. Quevedo created a political dynasty that held power for decades. Quevedo was part of a group of cacique governors who engaged in political power plays supported by illicit activities whether drugs, smuggling alcohol, prostitution, or racketeering. President Manuel Ávila Camacho worked closely with the United States in crop eradication instates such as Sinaloa, Durango, Jalisco, and Baja California. During WWII, he arrested drug traffickers and jailed them without due process. Yet, his brother the Maximino was one of the cacique governors who also dabbled in the drug trade. 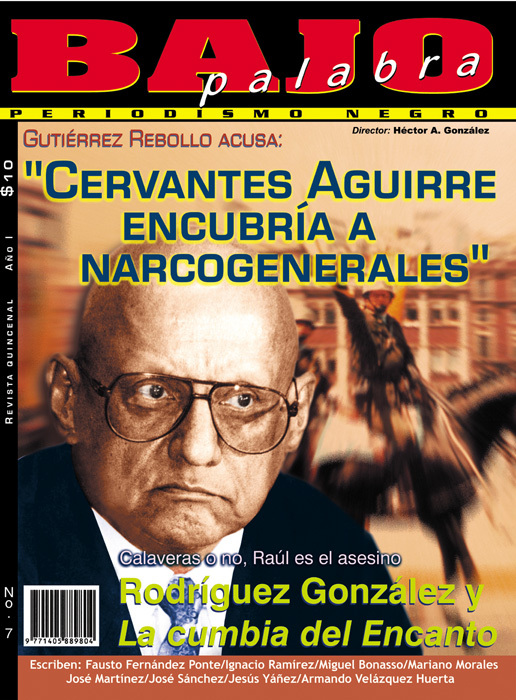 Jumping to the recent past in the 1990s, more evidence emerged of ties between los narcos and the political elite when Jesús Gutiérrez Rebollo director of the National Institute to Combat Drugs was arrested on corruption charges. Narcogeneral Gutiérrez Rebollo protected Amado Carrillo Fuentes, the “Lord of the Skies” and his Juárez cartel while he pursued their competitors, the Tijuana cartel. Gutiérrez Rebollo rose through the ranks and was appointed to the position despite allegations of financial improprieties during the Salinas administration. Journalists claimed he maintained a family, but also two mistresses and various children. 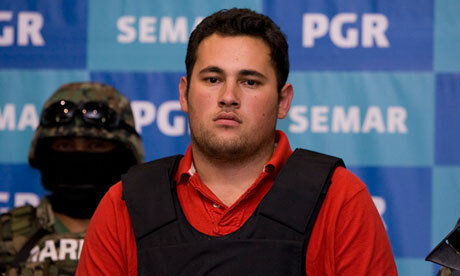 Many Mexican observers questioned his role in drug trafficking. The prosecution of Gutiérrez Rebollo led to unfounded countercharges that then President Ernesto Zedillo’s family was involved in the drug trade. Despite those efforts, Gutiérrez Rebollo was sentenced to forty years in jail. Yet, the speculation between the administration of Salinas de Gotari and drug traffickers continued. 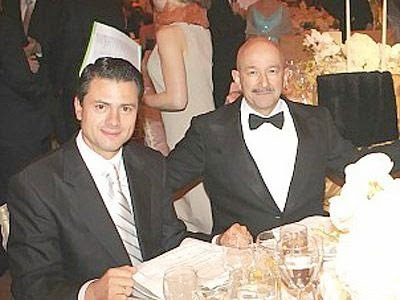 As ex-President and political godfather to Peña Nieto, Carlos Salinas knows, a president can’t always control the drug dealings of his cousins, brothers, in-laws or those in his administration. The question, however, remains: will the Peña Nieto presidency be a historical continuity or a contingency? Please, place your bets.